The Needler’s Retreat 2015 is coming up quickly. Taking place at the beautiful Glen House Inn in Gananoque again, this one will be really exciting for me. I’m preparing for my first Vending experience, a little nervous but glad it’ll take happen in a place and with folks I’ve known for a few years. I’ve spent the morning doing Graphic Design work for my advert sheets and presentation binder and updating the files for my business cards. For now I’m just creating labels to stick on the old ones and bring them into this decade. I’m happy too, to have connected with a tech editor for KeiB Designs. I think it’ll add a professional touch and I know as a knitter, I appreciate that feature. I’ve been working like a stevedore on the “Knitting / Guest” room and am really happy with the results so far. I’m still inundated with yarn (please visit my stash for sale on Ravelry and adopt some) but as of today, I have almost all of it in the one room. I did get some shelves (bamboo – recyclable and biodegradable – yay!) for my own closet and for the front hall. A little more work to do there as I’m still slowly working my way through old clothing and aiming for one more big donation to Diabetes before the end of the year. I put together coffee tables for the living room and finally replaced my 1960’s folding card table that was curb-dived about 10 years ago and has been serving as my kitchen table. Next up, I’m going to tackle what will be my office / sewing and needle work room. All in good time, I don’t procrastinate so much as to lose my title but I’m finding I have to make a mess in order to clean up a mess. It is so worth it though, as I’m getting better at getting rid of the things that make my life “heavy”. I’m still working on the BW wrap and the Falling Leaves cowl but did get a wee bit bored and so took a break to whip up Anna Hrachovec’s “Boo Bat“. My daughter is crazy for bats and we kept a bat house at the old home. I love this cute little ami and can see a few more for her (I can’t tease her about being too old for bats. I still will buy anything Hello Kitty!) I am seeing trying my hand at some different techniques to create my own pattern but we’ll see how that goes. I know the weeks between now and Retreat weekend starting November 6th, will fly by. Vespertillia. Just waiting for her safety eyes to arrive and then to finish the seaming. Falling Leaves On Moss. A better capture of the SockItToMe colour. Part of my Vending set up. One can get into the room without pole vaulting. Win! My favourite tree, now in Autumn colour. This seemed to happen so fast! So happy with these! Perfect scale and keep the room open and bright. I’m wrapping up my week with an FO and buried under snow from the storm yesterday and through the night. This does not stop life here, Canadians know snow. First up, I wrapped the test knit for “Cairo” and will be taking photos and doing the writeup for the pattern today. Here’s my “just for the record” photo, there’ll be better ones! The Cascade Venezia was lovely to work with, I may even try to find an excuse to work with it again soon, no matter the size of my stash. 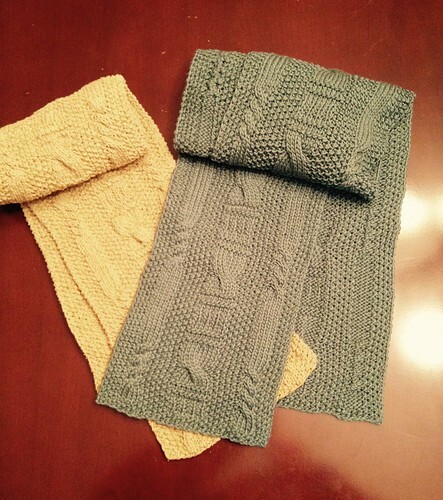 The design prototype is on the left in 100% raw silk and the test knit is on the right in Venezia. The printed versions of “Les Cloches Cannelées”, were dropped off to my LYS, Yarn Forward on Tuesday and I’m crossing my fingers. Selling digital copies is wonderful and I had a wee flurry of interest this past week that’s been a huge boost in light of some stress in my life. I do love the idea though, of the patterns being in a place where knitters are, where they can pick up the pattern, hold it up to the yarns on display, make their choices. Knitting and crochet are tactile crafts and that is a huge part of why I enjoy it so much. 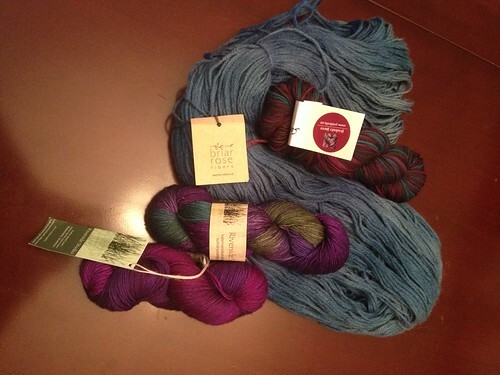 The next knitting project is the “Stella Luna” shawl. I’ll be using that gorgeous Tosh Merino Light in “Lepidoptera” that I picked up at last year’s Needler’s Retreat. There are large areas of stocking stitch in this pattern that I think will be ideal for showing off the colourway. How are all of your first project 2015 crafts coming along? It’s kind of like a yarn bomb Friday because… I have nowhere to put the darn stuff! I will spare you a photo of my “Guest Room”, where I try in vain to pretend that my yarn doesn’t live there. Oh well… All the more reason to knit faster!